Rockcote Enterprises presents the newest acrylic render in their collection –Tuscany Trowel On Coarse. 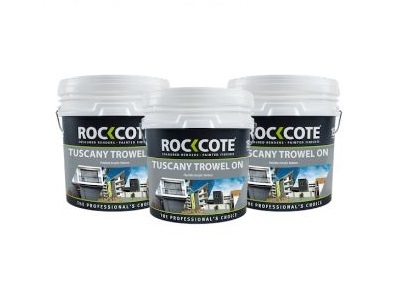 Rockcote’s coarsest acrylic render yet, Tuscany Trowel On Coarse is recommended for projects that require a very coarse and economical finish. This acrylic render is also ideal for use over rough surfaces to help provide a visibly flatter appearance with a coarse texture finish. Specifically formulated to be highly crack resistant and flexible, Tuscany Trowel On Coarse provides an easy float finish, eliminating any need for sponging after application. In addition to excellent adhesion qualities, the render can be tinted to match with the final coats. Tuscany Trowel On Coarse should be coated with a suitable Rockcote primer (optional) and two coats of Rockcote Armour (required). It is suitable for use in a full Rockcote system over properly prepared substrates including brick, block, off-form concrete, cement renders, previously painted masonry, Rockcote render, fibre cement sheeting, concrete, AAC panels or blocks and plasterboard.